AGUERO, A. and DE SILVA, H (2009), “Bottom of the Pyramid Expenditure Patterns on Mobile Phone Services in Selected Emerging Asian Countries”, 4th Communications Policy Research, South Conference, Negombo, Sri Lanka. BETTI, G (2000), “Quadratic Engel Curves and Household Equivalence Scales: the case of Italy 1985-1994”, Statistics Research Report LSERR50, London School of Economics. CHAI, A. and MONETA, A (2010), “Retrospectives, Engel Curves”, Journal of Economic Perspectives, Vol. 24, No. 1, pp. 225-240. DEATON, A. and MUELLBAUER, J. (1980), Economics and Consumer Behaviour, Cambridge: Cambridge University Pres. DIVISEKERA, S. (2010), “Economics Of Tourist’s Consumption Behaviour: Some Evidence From Australia”, Tourism Management, Vol. 31, No. 5, pp. 629-636. HOUTHAKKER, H. S. (1987), “Engel’s Law”, The New Palgrave: A Dictionary of Economics, Vol.2, Editors: Eatwell, J; Milgate M. ve Newman, P., The Macmillan Pres, pp. 143-144. JANG, S., BAI, B., HONG, G, and O’LEARY, J. T. “Understanding Travel Expenditure Patterns: A Study of Japanese Pleasure Travelers to the United States by Income Level”, Tourism Management, Vol. 25, No. 3, pp. 331–341. JANG S. and HAM, (2009), “A Double Hurdle Analysis of Travel Expenditure: Baby Boomer Seniors versus Older Seniors”, Tourism Management, Vol. 30, No. 3, pp. 372-380. KOZAK, M., GOKOVALI, U. and BAHAR, O. (2008), “Estimating the Determinants of Tourist Spending: A Comparison of Four Models”, Tourism Analysis, Vol. 13, No. 2, pp.143-155. LEE, H. (2001), “Determinants of Recreational Boater Expenditures on Trips”, Tourism Management, Vol. 22, No. 6, pp. 659-667. LEWBEL, A (2006), “Engel Curves”, Entry for the New Palgrave Dictionary of Economics, 2. Edition. NICOLAU, J. L. and MÁS, F. J. (2005) “Heckit Modeling of Tourist Expenditure: Evidence from Spain”, Journal of Service Industry Management, Vol. 16, No. 3, pp. 271–293. ODUNGA, P.O. (2005), “Choice of Attractions, Expenditure and Satisfaction of International Tourists to Kenya”, Unpublished PHD Thesis, Wageningen Universiteit, Nederland. PEREZ, E. A. and SAMPOL ,C. J. (2000), “Tourist Expenditure for Mass Tourist Markets”, Annals of Tourism Research, Vol. 27, No 3, pp. 624-637. PEERAPATDIT, N. (2004) “The Impact of Selected Socio-Demographic, Travel Related and Psychographic Variables on Travel Expenditures”, Unpublished Postgraduate Thesis, University of Central Florida, Rosen College of Hospitality Management: Orlando, Florida, USA. PONGSIRIRUSHAKUN, A. and NAEWMALEE, K.(2003), “An Analysis of Foreign Tourist Expenditure in Thailand, TDRI Quarterly Review, June 2003, pp.1- 22. RAMANATHAN, R (2002). Introductory Econometrics with Applications, USA: Harcourt Brace Jojanovich College Publishers. SHUIB, A. and BULAN, D. (1996), “Expenditure Patterns of Singaporean Tourists in Malaysia”, Pertanika Journal of Social Sciences and Humanities, Vol. 4, No. 2, pp. 165-173. TARI, R. (2002), Ekonometri, İstanbul: Alfa Press. TUIK Tourism Statistics, http://tuik.gov.tr/AltKategori.do?ust_id=14 07.03.2012. UNWTO, “Tourism Market Trends-World Overview & Tourism Topics”, 2006 edition, Annex-3. VARIAN, H. R. (2006), Intermediate Micro Economics, New York: W.W. Norton & Company, Inc.
S. Kim, H. Han and K. Chon, (2008), “Estimation of the Determinants of Expenditures by Festivals”, Tourism Analysis, Vol. 13, No. 4, 2008, pp. 387-400. ISNAD Korkmaz Bingöl, Fehime , Bahar, Ozan . "Factors Affecting Tourist Expenditure Coming To Mugla Region". 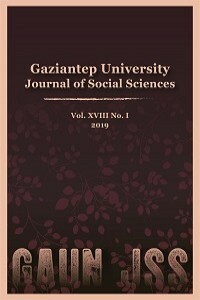 Gaziantep University Journal of Social Sciences 11 / 2 (December 2012): 293-308.